Uncyclopedia has an audio version of this chance encounter! 1 So... How are Things? 4 So... How are your Parents? Right... Right... Oh! Do you still see anyone from work? Oh, right... Now that I think about it I do remember hearing you had been, uh, let go. What'd they get you for, making them look bad with all your sales? Hahaha...haha... Oh... Well, yeah, they do look down on sexual harassment nowadays... Yeah, I guess the settlement did say you couldn't have any contact with any of your old co-workers... Well, ahhhh... I guess I'm ok, since I'm another guy, haha... Really? You were sued by both women and men... That's, a...heh heh...Ummm, that's just how it... err.... goes sometimes, I guess... Well, ummm... where did you go after that? Bigger and better things for sure... Wal-Mart!... right... right... You're a manager? Oh... Well stocking shelves uhhh... isn't... that bad. I mean, you could have been a janitor. Now that would have been pretty awful... Oh... So I guess you became one after you quit... Fired from Wal-Mart too, huh?... That's... uhhhh... interesting... Umm... What for?... Well, yeah, I guess it is hard to keep a job while you're in jail...hehehe... You know what, I don't think I really need to know why you were there... Oh, so, uhh... part of your parole is that you have to tell everyone you talk to... And all of your neighbors... And you have to tell every store owner before you go into their store... Right, ahhh... You know what? Ummm... You don't need to tell me. I'll just... well, ummm... How about we just guess I can figure it out later... Yeah, that's probably for the best. ... Ah... Ummmm... Right... Heh heh... Well... Ah... Hey, didn't you have kids too!? Yeah! Little Jack and Denise, I remember you talking about them. You said they were your life; the whole reason you are alive... Oh... Your wife took them with her to Texas. That's... Awful, man. I'm really sorry about that... Yeah... Uhh... So... Do you still see them for summers?... Oh, they won't let you have the kids with you for a whole summer if you don't have a house... Right... Well, uhhh... I guess that makes sense. They can't sleep in your '91 Civic every night... No, probably not even with the pleather seats... Well... Ummm... would they let you see them if you... uhh... stayed at a friend's house?... Oh, no, not mine!... There's... ahhh...Heh heh... ummmm... just not enough room in the house... Yeah! The house is just a little too small... What? I told you it was pretty big earlier? Ummmmm... Well, you know how us guys can be. We're always lying to make things sound bigger and better than they really are...... Well, what about another friend's house?... Oh, yeah... I guess you can't see the kids with, uh, the jail sentence hanging over you... No, really, you...really don't need to tell me why you were in jail... It's fine. So... How are your Parents? 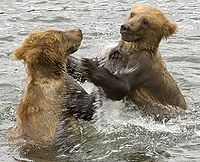 Two "ferocious" bears after the kill. Awwww.